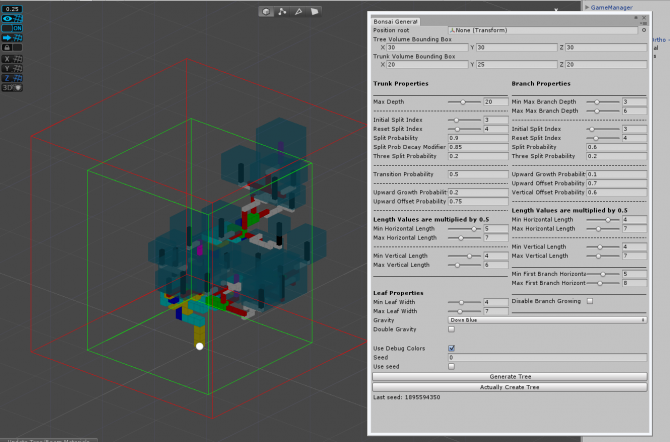 If you rotate any part of the tree and then apply mesh merge, you end up with floating branches. Needs to get fixed. 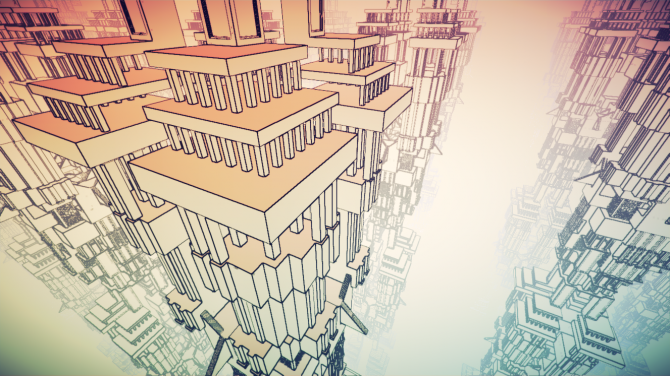 Trees are a pretty important part of the core gameplay system of Manifold Garden. 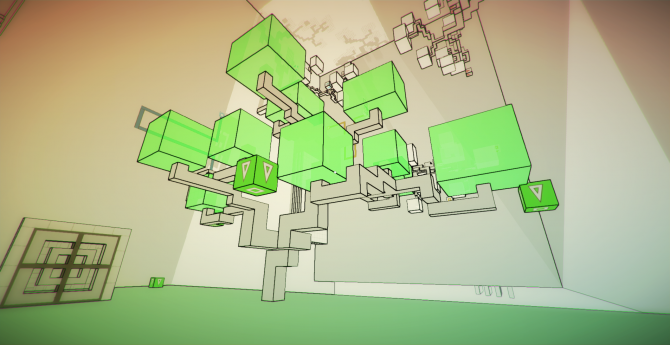 After all, trees are the source of the cubes, which are used to solve puzzles, bend water, and grow more trees. All of the trees above were made by hand. You can see that the same tree repeats many times. I was originally planning to make 100 trees by hand. I made about 4, before I realized that process was not fun and also super tedious. 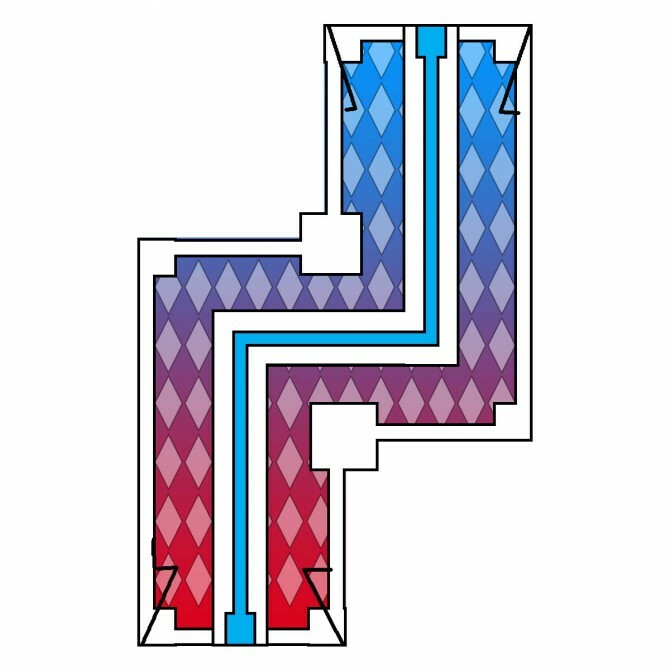 Like the old ways of building stairs and windows, it involved using ProBuilder and building each separate component, manually sizing and placing every segment. 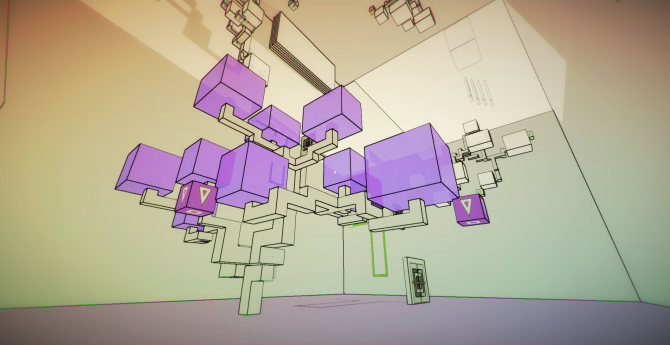 Some people have asked “why not just create a set of 10 trees or so and randomize their placement?”. The reason is because the volume of the tree matters a lot in a level. If there are only a set number of trees, I would actually have to design the level based around their volume, and the specific needs of trees vary widely from location to location. 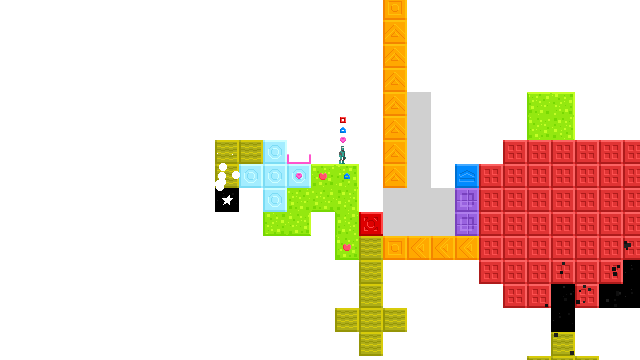 A much more typical process for me is I’ll design a level, and then go: “this area needs a tree, but it needs to be 20x40x20 in volume, because of the setup of the level”. If I just have a fixed set of trees to choose from, it’s highly unlikely I’ll find a tree that’s exactly of that size. 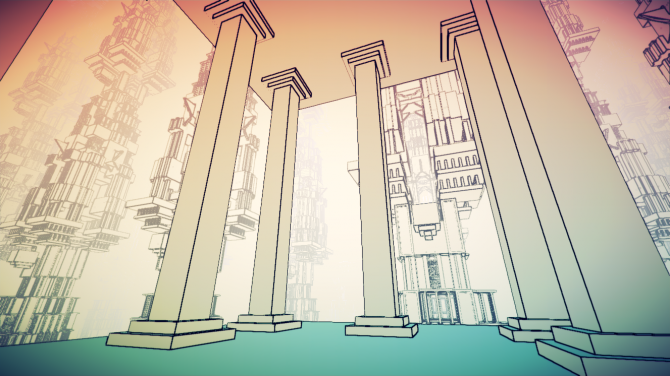 Also, using a fixed set of trees can get pretty obvious to the player. Anyway, the trees do follow a very specific ruleset in their look, so there’s really no reason that the process can’t be automated. David and I decided to make a tree generator for this. As you can see, it takes a lot of input. You can choose the probability for growing upwards, the probability of a trunk or branch splitting into two, the range for each segment (vertical or horizontal), etc. The red outline box is the tree boundary, and the green outline box is the trunk boundary. The idea is that the trunk would never grow outside of the green box, and the tree would never grow outside of the red box. They’re kind of soft boundaries (especially the red box as the leaves can go past the boundary). However, it’s pretty easy to tweak, which is part of the tool design. You hit “Generate Tree” to create a tree, and then if you actually want to make it a tree in the game, you hit “Actually Create Tree”. This allows me to go through a bunch of variations to pick out the one I need, which is really great. Once the tree is generated, it’s actually all in separate parts, with each branch parented to the one it grew out from, so it’s quite easy to edit (or should I say… prune?) the tree and tweak it till I get exactly what I want. It also saves the seed value, so you can always go back to the base design. 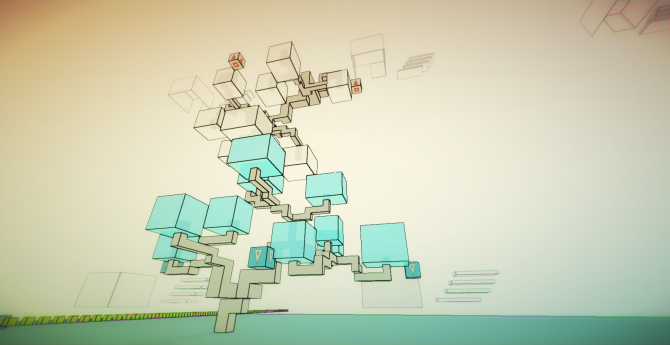 The key with the tree generation algorithm is that each segment uses world coordinates to determine the direction. So the y positive is always up. This was thanks to David. I’ve done some procedural generation with fractals before, and always used local coordinate systems, with each object passing on its rotation and position with relation to its parent to the next object. In this case, none of the objects had a sense of the objective up, only in relation to its previous object. This would actually have been pretty complicated, involving passing on rotation with matrices and all that. Using the world coordinate system worked out quite well in this case and made the algorithm a lot easier to manage and piece together. It works in this case because the trees do have a sense of “up” when growing. Anyway, what I love about the tool is that in the time it used to take me to make one tree, I can go through hundreds of design in the same time. Once the tree is built, there still needs to be some processing done to make it work in the game. Of course, I made a tool for this as well . That will be in the next update. 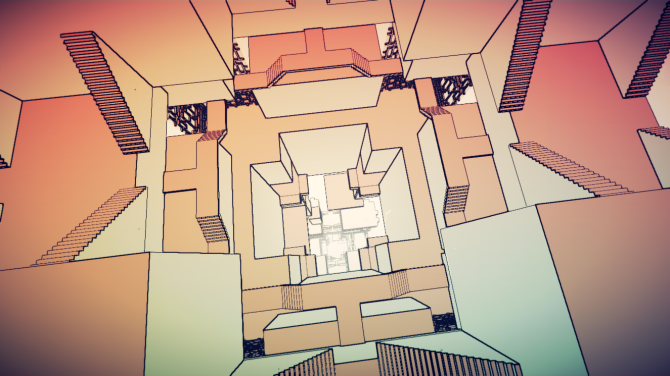 There are A LOT of staircases in Manifold Garden. 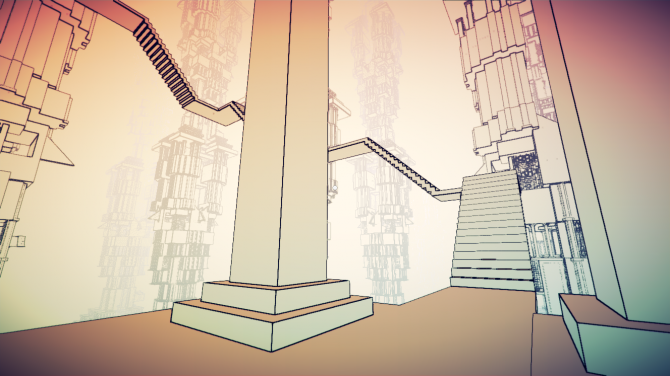 It took way too long for me to finally get around to writing a staircase generator, but I’m really glad I did. Now, ProBuilder does have a staircase generator, but the stairs in Manifold Garden have to be built in a very specific way. 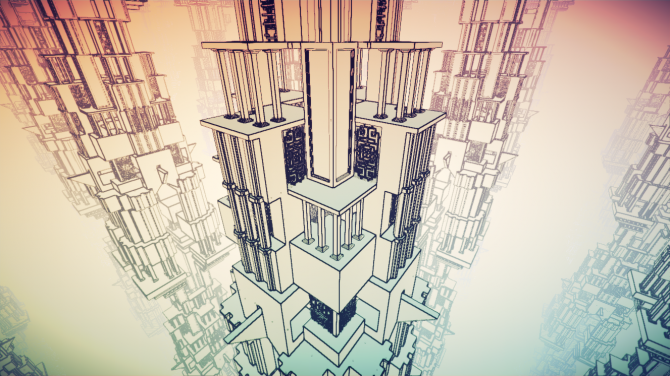 0.5 is the smallest unit for the geometry in Manifold Garden. All the floors, walls, etc, are at least 0.5 units thick. 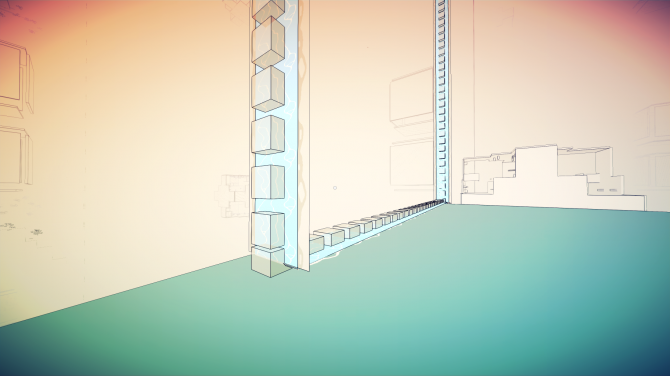 Since you can change gravity and walk on any surface in the game, every staircase needs to work on both sides. 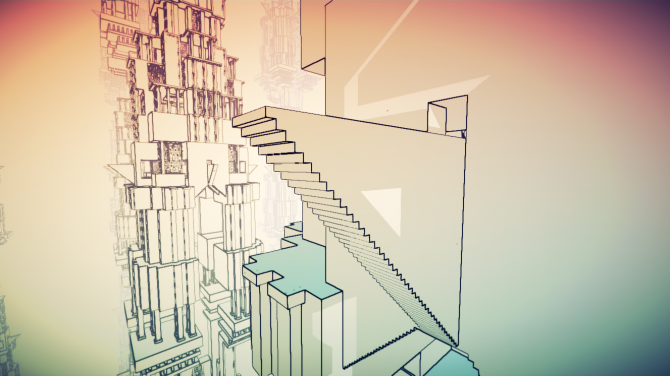 The player can walk on the top surface of the stairs, as well as the bottom surface of the stairs. 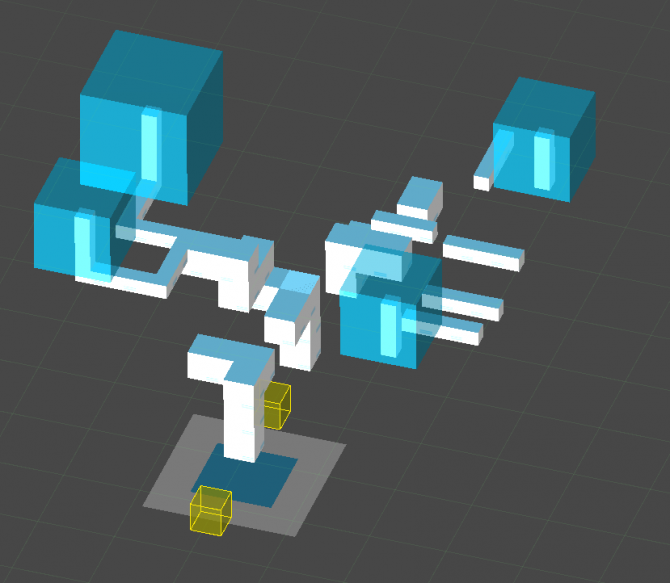 The individual steps are ProBuilder cubes, which I have to manually put in place. Once there are few, you can speed up the process by duplicating multiple steps at a time. It’s still quite slow though. Then I have to make the “ghost steps”. 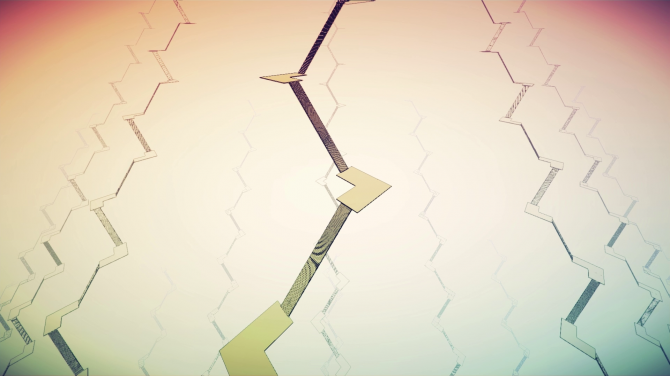 These are the small invisible steps that the player actually walks on. 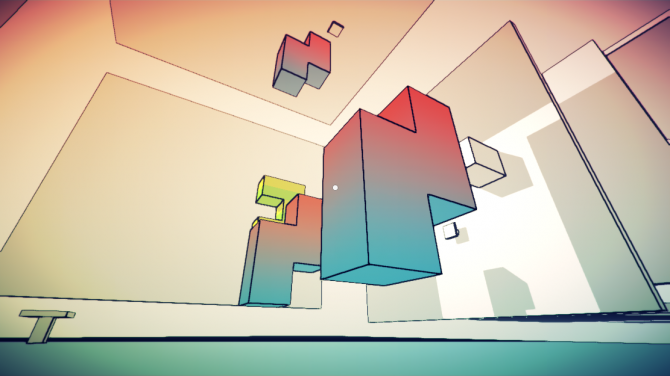 The visible steps are actually too tall for the player to climb, since the player doesn’t actually have legs and is a just a capsule. 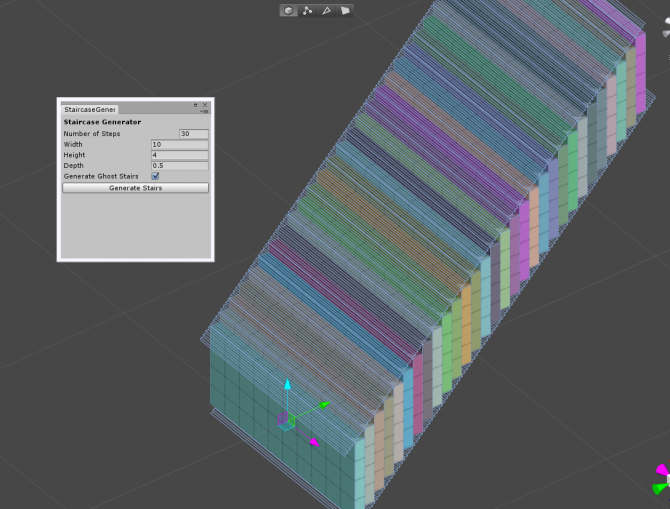 The ghost steps are made with ProBuilder staircase tool. 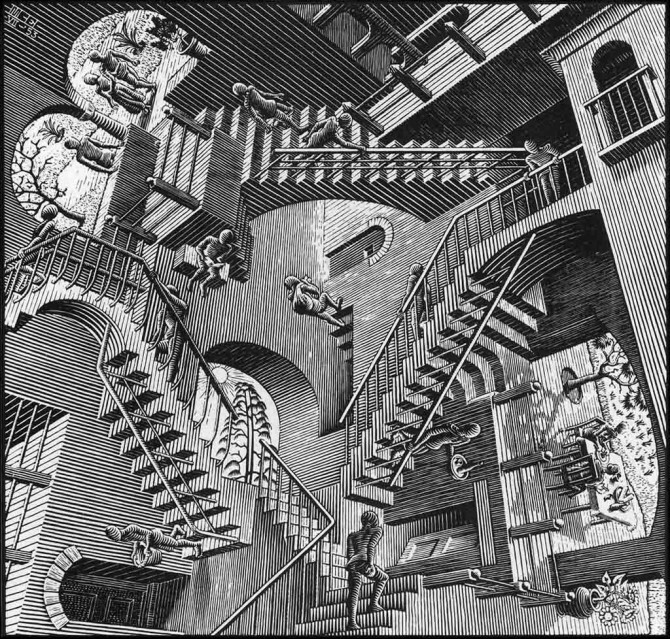 However, it still takes time to figure out the size of the ghost steps, the number of steps, and also to put it in the correct position. Anyway, for a long time, due to the 0.5 thickness requirement, I actually thought that all floors had to be 0.5 units thick and no more. 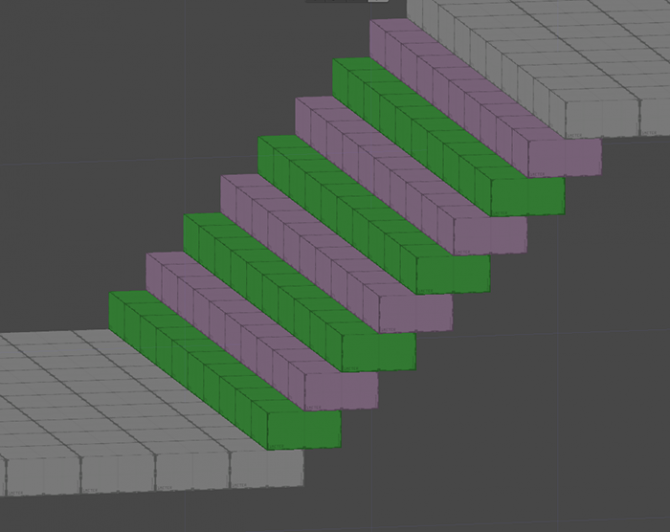 Eventually, I realized that there was actually a way to build stairs to allow for thicker floors. 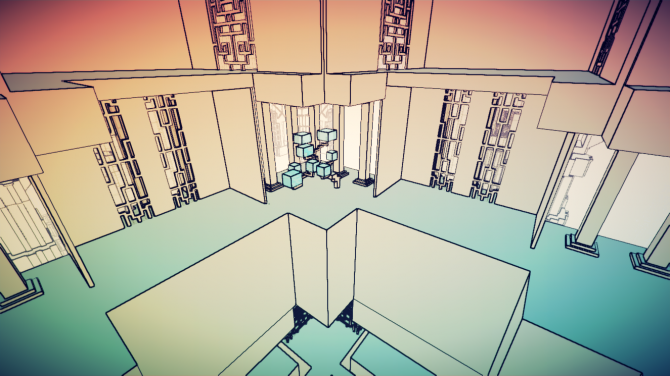 Thicker floors are actually quite nice because this means that the player can walk on the sides of the staircase as well, instead of just the top and the bottom. As you can see in the image above, this allows for the floor to be 2 units thick while still making the staircase work from both top and bottom surfaces. 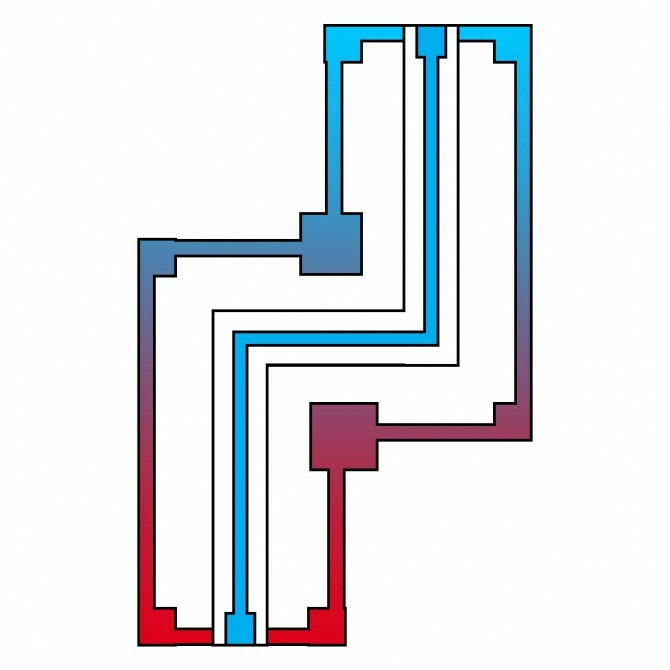 The tool automatically decides whether to stack horizontally or vertically depending on the step height assigned, and places the ghost steps accordingly. 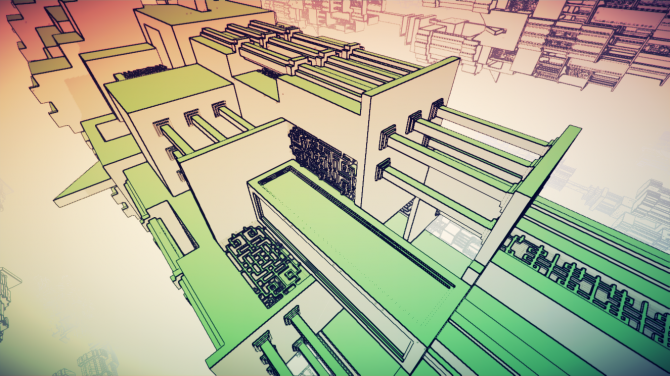 It also puts everything inside a parent object and names it with the width, height, and number of steps. It also assigns the correct tags and layers to the objects. The tool took about a weekend to make, and now a step that was rather tedious for me, and took minutes to do, is now done 3, 4 button clicks in the span of a few seconds. Reading through the code for water. I’m finally starting to figure out what’s going on. It feels good to finally get back into coding again. Been so busy last few weeks with non-development work. I think a gradient base works really well. It needs some work though. Diamonds need to be there to show direction. Maybe having this background pattern? Making the end of the white lines arrows?